Have fun in the swimming pool while riding on the back of an oversized, inflatable bird. This fun bird features a big, black body with a tail and two flamboyant wings. Its large head sports bright, round eyes and a long, colorful beak. This enormous pool float measures 81.5-in x 61-in x 35-in when fully inflated. Its giant size is perfect for riding, lounging, playing, or sunbathing. Enjoy easy deflation for convenient storage and travel. Bring tropical fun to the pool this summer! 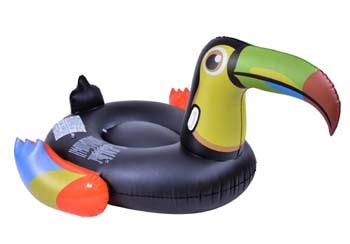 GIANT POOL FLOAT - This giant, tropical toucan measures 81.5-in x 61-in x 35-in when fully inflated. It’s big enough for an adult or multiple children to ride and play. COLORFUL TROPCIAL TOUCAN DESIGN - This blow-up pool float is shaped like an enormous toucan. The large body is black with tropical colors on the wings, head, and beak. EASY TO INFLATE - This toucan may be giant, but it deflates easily for storage or travel. Once you’re ready, quickly inflate it for a relaxing time at the pool or lake. FUN FOR THE WHOLE FAMILY - This enormous pool float is great for riding, lounging, playing, or sunbathing. Parents will love relaxing and lounging on this giant. Kids will have a blast hugging and riding a tropical bird.